London claimed their first win of the season with an impressive 2-10 to 0-8 win over Wexford. A strong second-half display saw Ciaran Deely’s charges over the line in Ruislip. The visitors took the lead initially thanks to John Tubritt before the Londoners quickly levelled affairs through captain Liam Gavaghan. It remained a tight affair for much of the first-half with both sides enjoying spells of possession. London came close to landing the first significant blow when Mark Gottsche hit the crossbar with a fierce strike. 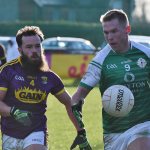 Wexford then hit back at their hosts thanks to John Bealin as the visitors looked to try and get in control of the game. The Exiles looked like a team on a mission to finally get some points on the board and came fighting right back thanks to David Dunne pointing, before Killian Butler reduced the difference to a point at the break. The home side started the second half brighter as Butler and Conor Doran helped them take the lead. Brian Malone kept the Leinster side in touch with a point. But London finally made their pressure count when Killian Butler was played into space and fired home for the game’s first goal. Minutes later substitute Ciaran Houlihan made the perfect impact moments after he came on as he got the final touch on a high ball that was knocked into the Model net. The second goal proved the sucker punch for Wexford who looked deflated, as London pushed on for an eight-point win. The Yellowbellies will be disappointed with their showing, after last week’s win. Meanwhile, the Londoners will be full of confidence ahead of their visit to Antrim in two weeks. London: Gavin McEvoy; Philip Butler, Michael Clarke, Matthew Moynihan; David Carrabine, Aidan McGarvey, Ryan Jones; Ryan Forde, Liam Gavaghan (0-5, 3f), Conor O’Neill, Mark Gottsche, Barry Tully; Conor Doran (0-2, 1f), David Dunne (0-1), Killian Butler (1-2). Subs: Adrian Hanlon for Forde (45min), Eoin Flanagan for Jones (52min), Pierce McGirr for Dunne (56min), Ciaran Houlihan (1-0) for Doran (66min), Liam Gallagher for Tully (70min). Wexford: Matt Doyle; Michael Furlong, Mark O’Neill, Conor Carty; Brian Malone (0-1), Shane Doyle, Martin O’Connor; Daithi Waters, Niall Hughes; Kevin O’Grady (0-1), Jonathan Bealin (0-5f), Eoghan Nolan; Barry O’Connor, Eoin Porter, John Tubritt (0-1). Subs: David Shannon for O’Connor (26min), Ben Brosnan for Tubritt (43min), Robert Frayne for O’Grady (52min), Michael O’Regan for Shannon (52min), Tiarnan Rossiter for Porter (66min).